In the very early days of loss, many grievers will describe feeling as if they’re in a constant fog or haze. A fog so thick that it can bundle several weeks or months into one big blur. And as terrible as that may sound, the lifting of this fog can create a stark reality so blinding it can be almost impossible to bear. It’s the reason so many grievers will describe their grief as getting worse as time passes. While we expect time to be a healer, those who have had a loss will usually find they are struggling more as the weeks and months go by. The timing is misaligned in every way. Just as the support is slowing down, as friends and family are checking in less and expecting the griever to be doing better, the weight, reality, and magnitude of loss is just starting to sink in. It’s about this time when a griever begins to wonder what now and what comes next. Who am I and where do I go from here? Deciding to self medicate isn’t usually a “decision” at all. For many it’s something that just sort of happens. A glass of wine after dinner, a drink out with a friend. The softening of the hard edges of grief, the numbness…for some it may just be too hard to resist. There’s been an unfortunate trend in the stories shared by our grievers lately. 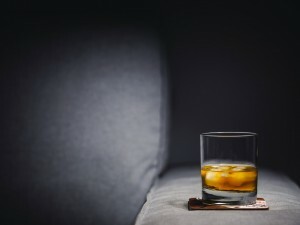 As the tales of grief and loss unfold, many have admitted (with a surprising amount of candor and self-awareness) that alcohol has been something they’re turning to more regularly to cope. This is such a tough discussion to get into. For one thing there are so many levels of abusing alcohol. There are those just on the fringe, drinking a little at night with the hopes of a deeper sleep. And those diving all the way in and losing whole days and nights, with no memory of what goes on when they’ve drank. The bottom line is there is no safe level of abusing alcohol. If at any time it is being used as a tool, a crutch or a means to an end (or as Billy Joel would say, “to forget about life for awhile”) than there is an issue to be addressed. The things we say or the way we act when drinking: anyone who has been around drinkers knows there’s a lot of different types of “drunk”. The happy drunk, the sad drunk, or perhaps the normally mild-mannered person who becomes aggressive or even mean when they drink. It’s important to remember that grieving is a time of self discovery. As so many grievers are trying to figure out who they are without a loved one they’ve lost, adding this other facet to their personality (even temporarily) can make it very confusing for the griever and for those around them to know who they are and who they are evolving in to. A clear head and consistent behavior is a necessary part of this journey, as is time for clarity and introspection. Time with friends and family: if the only time a griever is spending with friends or family they are drinking, their friends may not have a clear sense of how they are really doing. More importantly, as most locations for a drink are dark, loud, and crowded, it can mean that a griever is missing an opportunity for meaningful conversation with those they love. If the only time a griever is socializing with others they are abusing alcohol, they have the potential to remain as lonely as if they weren’t spending time with anyone at all. The way alcohol can isolate: conversely, alcohol can keep people home. For some, a quiet night at home drinking can be much more appealing than going out. Those who are abusing alcohol may choose to forgo non-alcohol related activities (like the movies, for example), to drink at home alone. Relationships can be seriously affected when someone who has had a loss chooses alcohol over friends and family, and outlets for support can quickly diminish when a drink is chosen instead. Decisions we may make while intoxicated: no big decisions should be made in the wake of a loss. While timelines are different for everyone, the advice I’ve heard most often is that a griever should wait a year until they decide to move, change jobs, or even add a new pet to their life. The thing about life, and grief, is that it’s not always made up of big decisions. In fact most of our days are made up of a lot of little decisions. Making poor choices while abusing alcohol can only compound the suffering a griever feels. Because unlike the hangover that eventually fades, even small decisions can have long lasting effects. Whether it’s making a phone call to an ex while drinking, or telling the person who hasn’t been supportive just how you feel, the consequences that come with abusing alcohol may not be what the griever set out to do when they were just trying to forget about life for awhile. Whether abusing alcohol was something the griever did prior to loss, or something that started after a loss, it’s important to stop the cycle of self-destructive behavior and find help. Remember that emotional wounds need the same tender care for healing as a physical wound. Recognize how vulnerable and fragile the grieving mind is. While having a clear head may not sound all that appealing, alcohol provides only a temporary outlet. And the grief will wait. There is nothing more patient than grief and it can not be drowned or made to disappear at the bottom of a glass. Choosing to stay sober may feel like turning all the lights on in the house, opening every curtain and every shade and allowing every dark corner and crack to be revealed. But it is only in the light that healing can begin. Alcoholic Anonymous is a wonderful resource and there are meetings all over the country. If you or a loved one are abusing alcohol after loss, you can find more information here: http://www.aa.org. And most of all, remember what role this loss has had in the drinking. While support for alcohol abuse helps, it is equally important to get to the root of what started or compounded this problem. There are resources and tools available to help cope with the loss of a loved one. Whether it’s church, a support group in your community, or right here at www.griefincommon.com, connecting with others who understand can help you mend and rebuild in a way that alcohol never can. Next Next post: No Time to Grieve: Can we be too busy for grief?